The Big Mac index 2011 shows how much currencies have deviated in 2011 from their true values. The Big Mac Index 2011 is based on the principle of the Law of One Price and relates to the theory of the Purchasing Power Parity. Based on the Law of One Price, identical goods sold in two markets should sell for the same price. That being said, the "goods sold" in the case of the Big Mac Index 2011 is a single product, the Mc Donald's Big Mac hamburger. The Purchasing Power Parity (= the exchange rate that equates the price of a Big Mac in two countries) is calculated by comparing the price of a Big Mac sold in the foreign country and expressed in local currency to the price of a Big Mac in US dollars sold in the USA. The base point of the 2011 Big Mac Index model is the US dollar. After converting the price of a Big Mac sold in the foreign country to the USA dollar (using the actual USA dollar exchange rate), we can determine the extent to which the USA dollar is undervalued or overvalued. More information about how the Big Mac index is calculated (including the formula that you can use to calculate the values) can be found here: Big Mac Index. 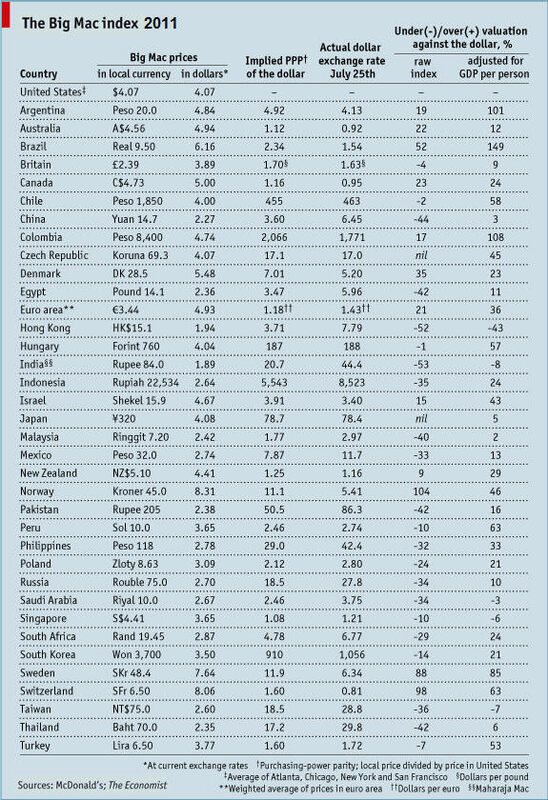 The following table provides the Big Mac Index values for the year 2011. The base point for the calculations is the US dollar. With the introduction of the McWrap product into the Mc Donalds portfolio, the McWrap being the more luxurious product, hopefuly we also might be able to calculate the Lorenz Curve, the Gini Coefficient, and the Robin Hood Index next year (measures of relative inequality).